Your boat’s camper top puts in a lot of hard work. Day after day, out in the sun, protecting your boat whenever it’s docked or when you’re out on the water and need shelter from the elements. If your boat’s camper enclosure is weathered and old, it will have a hard time doing its job. AmeritexDirect can help by providing completely new, exact replacements of your original camper top parts, including your camper top frame. Or, if your frame is in good shape, but the canvas has become worn and problematic, we’re happy to custom make the replacement camper canvas only, so that you can place it on your existing camper frame. Protect your boat like new again. 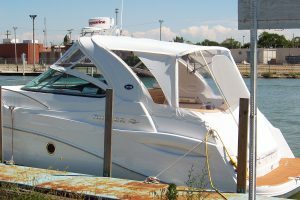 Find out if we offer a camper top for your boat here.